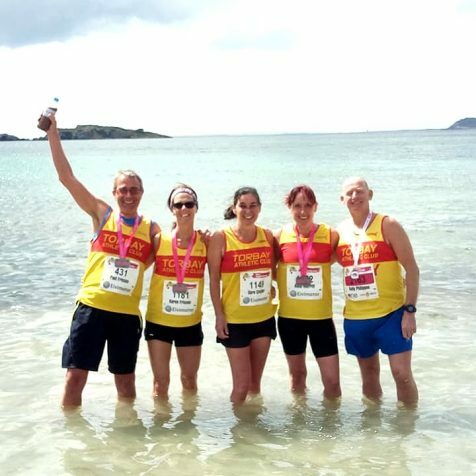 Five Torbay AC runners took a little holiday on the island of Ibiza and thoroughly enjoyed running the 10k and Half Marathon races, which pass through the most popular spots on the southern part of the island, to finish close to the beach at Marítimo Figueretes. Andy Philippou chose to run the 10k event finishing 2nd in his V55 age category in an excellent (55:04), considering his London Marathon experience last weekend!. In the Half Marathon event Paul Frissen achieved a PB of (1:42:20) Karen Frissen finished in (1.50.54) with Sara Jane Crozier (1:53:08) and Anita Merritt (1:57:10) All agreed this was a very enjoyable experience hoping to return with more Club runners next year!